lorini1 | What Are You Reading? October is the perfect month to indulge in the horror genre. I would love to share some of my favourite Reader’s Advisory horror tools, some spook-tacular display ideas, and one of my favourite horror novels. Add words such as “Thrills and Chills” to this creepy background. Mariko Koike’s The Graveyard Apartment is a great book to recommend to customers who love to read horror novels. After moving to a new apartment complex next to a cemetery, a young Japanese family experiences strange and terrifying occurrences that send the other residents fleeing their homes, ultimately leaving them alone with a dark, evil something, or someone, residing in the basement. If you are a fan of horror, please add your favourite reads in the comments below! This entry was posted in Uncategorized on September 28, 2017 by lorini1. Have you heard about NoveList Book Squad? Book Squad is a newsletter put out by NoveList that delivers RA tips and tricks, genre information, display ideas, and showcases interesting and relevant topics for discussion at your library. You can select a number of topics to receive information about, just like how NextReads works. I find Book Squad most useful for unique and simple display ideas. For example, a recent newsletter featured a picture of a “Killer Summer Reads” display with a selection of horror titles to get started. Most newsletters also come with readymade posters, bookmarks, and other printables that you can use in your own library. Easy peasy lemon squeezy. It’s a good idea to make sure all the titles are in your library’s collection before you print out posters. Even if you’re not interested in printing out any of the materials, it is a good way to ideas for displays and then populate them with books right off your own shelves. If you don’t like the display they’ve made, it helps to jump start the brainstorming process or bring new possibilities and topics to light. Of course, NoveList is interested in self-promotion, so the newsletters also provides tips for using NoveList for your RA inquiries, links to NoveList training materials like genre outlines, and other ideas about how to use NoveList at your own library. And, because NoveList is an American company, a lot of the content tends to be more American in focus. Have you used this resource and found it useful? Let us know in the comments below! This entry was posted in Displays, Marketing and Promotion, Uncategorized on September 7, 2017 by lorini1. Lately I have been receiving many author read-alike requests from patrons. A useful tool for recommending read-alike authors is the Literature Map: the Tourist Map of Literature. The Literature Map is part of Gnod (Global network of discovery). It is based on Gnooks, Gnod’s literature recommendation system. I really like how authors enjoyed by the same readers are grouped close together on the map, and the more often that they are recommended together, the closer they appear to each other. The map provides a wide variety of authors, and it is easy to see which authors are most similar and which are a little different. For example, I get many requests for read-alikes for Louise Penny. Some of the closest authors on the map to Penny are Erin Hart, Elly Griffiths, and Charles Finch. These are recommendations that work well and I am happy to recommend them to patrons. However, it is also useful to note the authors that are placed a little farther away. Val McDermid, Laura Lippman and Maeve Binchy are not perfect matches, but they might be similar enough that the reader might consider them and be willing to try something new. Another great tool (that I think we all probably use quite often) is NoveList. I love using NoveList for author read-alikes, mainly because I can access excellent printable lists. Why is this useful? Having something to hand to patrons is fantastic. They have a list of potential great reads that they can explore at their leisure. This entry was posted in Uncategorized on December 28, 2016 by lorini1. Enjoyable as it is to immerse your self in an inches-thick book, having the time and focus to do so is becoming somewhat of a luxury–especially during the busy holiday season. Here are a few excellent titles to recommend to patrons that will only take a short time to read. Vinegar Girl by the renowned author, Anne Tyler is a modern-day retelling of Shakespeare’s, “Taming of the Shrew”. The story centers on Kate Battista, a preschool teaching assistant whose quirky personality always makes her presence known. She is put to task when approached by her scientist father to help his lab assistant stay in the country by agreeing to marry him. The drama that ensues between all the characters is mixed with more humor and gentleness than the original version but still makes for a lively, interesting read! Timothy Christopher Greene’s latest novel, If I Forget You, is a story of lost love. Twenty-one years after a love affair this memorable couple have parted; a chance encounter brings them back together. Each has married, Margot still unhappily married and Henry, now divorced. This love story is told in both past and present; each chapter brings a shift in time and delves into the different stages of a relationship. As the book evolves, each realizes that it is a love worth fighting for and one they do not want to lose again. This novel confirms how the choices we make can change the path of our lives forever. Jacqueline Woodson’s, Another Brooklyn is breathtaking! This unforgettable novel explores the beauty and hardship of girlhood in 1970’s Brooklyn. Woodson manages to bring four black girls, August, Sylvia, Angela and Gigi, and their separate home situations, to life in vivid color. The story follows their lives and struggles and the family conflicts that they all endure. The friends share their hopes and fears and learn all about the complexities of youth, loss, friendship, family, race and religion. Father’s Day, by Simon Van Booy is a beautifully written book about a little girl named Harvey. Harvey becomes an orphan at the age of six following a car accident that took the lives of her parents. Harvey is put in the care of her father’s estranged older brother, Jason, who has more than his share of problems. An ex-con and recovering alcoholic he is now suddenly thrown into the most important role of his life so far, that of a legal guardian to Harvey. Together they negotiate the map of life building beautiful memories while learning the importance of family. The Curious Charms of Arthur Pepper, by Phaedra Patrick is a fast read with unforgettable characters that move through grief and the process of starting over. After forty years of marriage, Arthur’s wife dies unexpectedly. On the first anniversary of her death he decides to clean out her belongings. It is here he finds a gold charm bracelet full of charms. He makes it his mission to trace his wife’s life through these charms. It is amazing what he discovers not only about her but also about himself in the process. This entry was posted in Uncategorized on December 16, 2016 by lorini1. My father-in-law Frank loves to read about the history of British Columbia. He enjoys wilderness adventure stories and pioneer memoirs. While searching for a good read for him, I have discovered some useful resources to find books for library patrons who are interested in reading about BC. 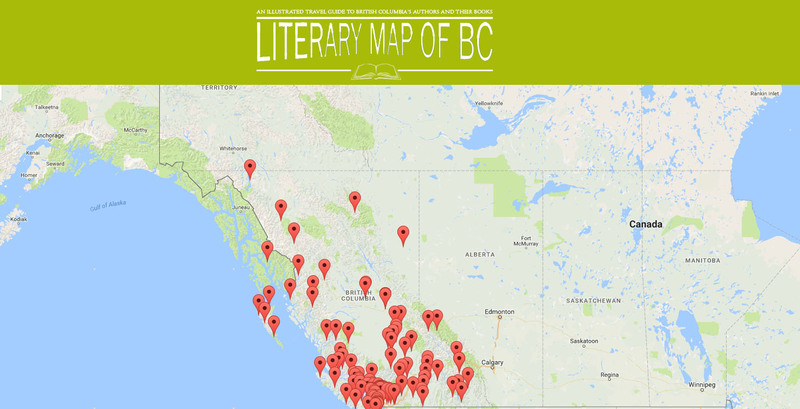 BC Booklook’s Literary Map of BC is useful to find authors who write about a particular area of interest. The site also has links to BC author blogs, and archives of BC bestsellers. Powered by 49thShelf, BC Books Online offers a user-friendly searchable database of books and eBooks written by BC authors. I was able to find many titles about Frank’s particular area of interest: the Cariboo-Chilcotin. There are many reading lists based on subject, theme, and place. What are your favourite BC reads? This entry was posted in Uncategorized on December 10, 2016 by lorini1.